NodeServ sends promotional emails to customers past and present. Unsubscribe information is included at the end of this email. Summer has hit the midway point and the temperatures are hot! Hope the warm weather is treating you well, and has you enjoying the great outdoors. We have some cool specials to help you and your wallet relax in the shade. Take it easy and sit back in the AC working on that new project without financial burden with our fix low-price terms on OpenVZ VPS plans. Pay for three months or 12 months and no emails and no payment distractions, plus you save a whole lot of $$! Money better spent on a refreshing beverages. The specials today are on our newer line of OpenVZ hosting packages, with DDoS Protection included, all for one low fixed price. NodeServ also has two special promotional products without DDoS Protection available which you can find after the DDoS-Protected offers. We run our own network AS19757 and have our own IP allocations. 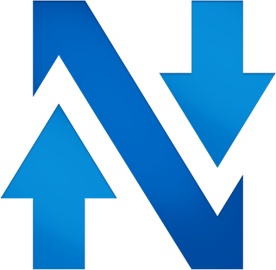 NodeServ is using DDoS filtering protection from a proven leader – Voxility. With total network protection of 500Gbps, Voxility is both able to handle malicious attacks and reroute traffic across its global network should a failure occur. We are connecting to Voxility via their filtering location in Miami. From NodeServ's Jacksonville location to Voxility's Miami location is just 10ms of latency. This low latency makes it possible to run any application successfully (audio, video, development servers, etc.). Below is a graph just showing how much and how big some attacks that were mitigated by our DDoS Protection. How does NodeServ DDoS Protection Work? New customer orders have the option of adding DDoS protection to their OpenVZ package for a monthly addon price of $3 per DDoS Filtered IP. These customers when provisioned will receive two IPv4 addresses. One will be a normal unprotected IP, the other will be the DDoS Protected IP. From our customer control panel customers can deactivate the public IP address should they want to or more advanced customers can manually configure their VPS to only use the protected IP address. DDoS protection is automatic. When and if your server is under attack the activity will be detected and Voxility protection will automatically go between you and the attacker. The detection can take up to one minute to take effect and for the attack to stop. NodeServ DDoS-Protection Now Available in Jacksonville Florida! 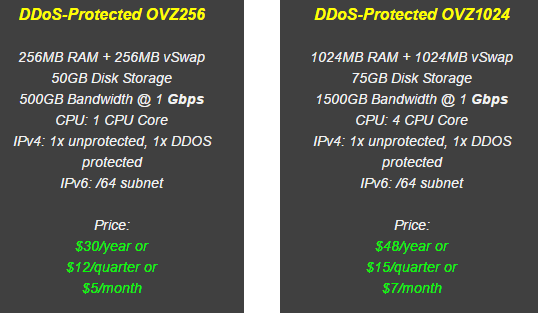 NodeServ is happy to announce it now is offering DDoS protected OpenVZ VPS hosting. With malicious DDoS (Distributed Denial of Service) attacks becoming so common, and with the impact from attacks becoming destructive to both hosts and customers, NodeServ decided to offer protection services. These attacks are growing in size and are regularly in the news and often blamed when online services are offline. DDoS attacks work by sending lots of requests from many networks simulataneously. This effectively floods the server, upstream router or in severe instances the entire datacenter. Attacks can last for hours, days, weeks or even months depending on how determined the attackers are. It doesn't matter if your hosting service is used for hosting your personal blog, a game server, chat server for your friends, your company website or for a large ecommerce site – downtime is devastating. We are including two promotional packages with HUGE savings so you can try our DDoS protection. These are available for a limited and promotion will expire. If you currently have an active service with NodeServ and would like to subscribe to our DDoS Protection you can! Please contact support and we will human-handle your service addon. This is a manual configuration process, so please allow up to 24 hours.